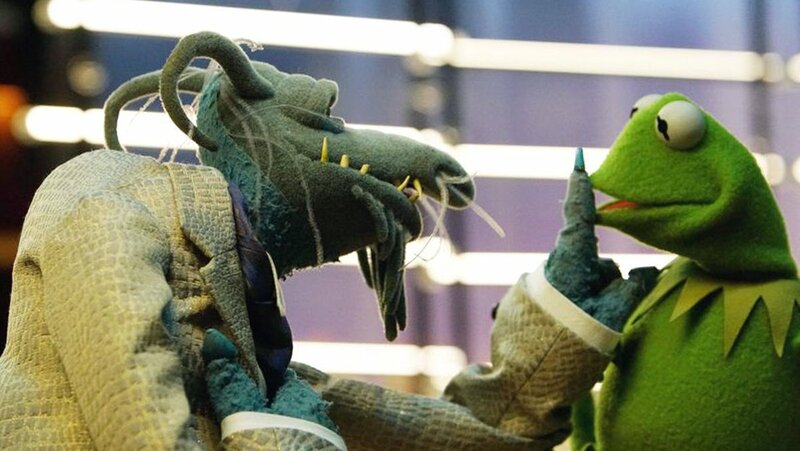 Tonight make plans to watch "The Muppets" new episode "Little Green Lie" at 8:30|7:30c on ABC. Then join the discussion immediately afterwards in the Muppet Central Forum. If you saw "Little Green Lie" please like this post and share your thoughts below. Pig's Laundry, Grovette, JimAndFrank and 1 other person like this. MONDAY FUNDAY! This was great! This episode was a BIG improvement on last week. While last week was very character driven and not particularly funny, this episode was a good mix of the two. This whole plot line surprised me more than once. I was expecting to see Kermit doting over Robin, but wasn’t expecting him to be so full of beans about it. Jump scaring Robin and Scooter was hilarious and it was refreshing to see the frog being so relaxed and playful. Miss Piggy also caught me off guard with her reaction to Robin’s arrival, but I suppose it only makes sense that they have spent some time together in the past. It usually irks me when old sitcom tropes are used over and over, but The Muppets always seem to make it fun. I don’t blame Kermit for wanting to protect his nephew from the truth. Parents getting divorced is bad enough without knowing that a couple Robin seems to hold on a pedestal has also given up on love. Piggy was wonderful this episode. Genuine sympathy for Kermit’s break up and agreeing to keep up the charade shows that Piggy really is improving. I never thought I’d say this, but Piggy is getting close to being in my Top 5 Favourite Muppets. She’s just behind Kermit, Lips, Rowlf, Rizzo and Beaker. All in all, the plot was predictable, but sweet and what you’d expect for anything to do with Robin. There was a heap of great Muppet moments when Kermit asked them to play along and Laser Tag was an awesome Muppet first. Watching Kermit and Piggy team up reminds you why they lasted as long as they did. The camaraderie was fun to see from those two again and it continued until they were at Rowlf’s Tavern. Let’s hope we see Robin again someday soon. Matt Vogel obviously had a hard time keeping the voice true to Jerry Nelson. Robin (and Gobo Fraggle for that matter) are particularly hard due to their voice being so similar to Jerry’s natural voice. Matt’s overall performance was that clean and good that I really didn’t mind it. I really don’t have much to say about this one other than I enjoyed it. It was another sitcom trope with a girl gate-crashing a bachelor pad. There was some excellent puppetry with the couple’s yoga, even if Gonzo did accidently kick Camilla in her dark meat! We found out why Rizzo won’t date snails and Drunk Pepe being rejected by his GMA crush after one too many photo-shopped bath photos. And if course we can’t forget Chip, Sam and Big Mean Carl somehow winning the hearts of women that are waaaaaayyyyyy out of their league! · The entire cold opening was fun. There was a great reference to Robin not aging or growing a single inch. Very clever Muppet writers! Bravo to you! · I loved seeing the entire troupe messing around and watching Fozzie trying to toss the ball into Big Carl’s mouth. One big insane family. · So many great character moments here! Fozzie’s acting skills and everyone scrambling from Robin. · Insert Uncle Deadly awesomeness here-The Electric Mayhem never ceases to astound me. · LIPS SPOKE-………a single word……Yeah, that still counts- LIPS SPOKE AGAIN! · Any excuse to give Sweetums more screen time is a good one. Even if his goldfish died! · Scooter, you idiot. “Oh no, you made the first person to lie on Twitter! · “I’ll go easy when life does”- We all feel that way sometimes. · Piggy and Kermit have become the new Bones and Booth for me. Especially in the last scene when they find an obscure way to say that there is still something between them without actually saying it. · “NOT HELPING!”- Thank you Rowlf for being the amazing comedic relief you are. LipsGF4Life, Branky, LouisTheOtter and 4 others like this. Grovette, LouisTheOtter, Muppy and 1 other person like this. This episode was pretty funny. It was wonderful to see Robin, Uncle Deadly got a huge laugh outta me when he said he has other secrets, Janice being a hippie and Floyd being a conspiracy theorist during the Friendly Feud game was great, the end where it's revealed that Camilla's friends are smoking hot human girls and they have a pillow fight where Camilla loses her feathers was hilarious. Wonderful episode! Great seeing Robin! As of tonight, I think were getting one step closer to the frog & pig getting back together!!! LouisTheOtter and Mo Frackle like this. Robin is adorable though his voice sounds like he got stepped on by an elephant. A lot of the jokes were funny and I am happy gonzo and camilla are back together because I wanted them back together. Miss Piggy playing laser tag is entertaining. Deadly showing up is always a plus. STOP MAKING THE ELECTRIC MAYHEM ACT LIKE BRAIN DEAD IDIOTS! seriously. Janice has NEVER been that stupid and Floyd has never been this out in space about the world. whose great idea was this to make floyd a paranoid conspiracy theorist? I HATE that! HATE! If they don't knock that garbage off I'm going to stop watching the show because the mayhem is some of my favorite muppets and they have NEVER acted like that before. Also Robin is 5 years old WHY is he allowed in a bar? ENOUGH with the side plots with rizzo and Pepe. JUST STOP! All I can say is this was a huuuuuuuuuge improvement over last weeks rather blah episode. You better watch out, Uncle Deadly knows three insignificant lies. He's counting on more. Carl eating Foofoo was hilarious. Hey, he got the ball, and he's happy. The gag with the Electric Mayhem on Friendly Fued and they couldn't name one of the flavors of ice cream they were surveyed on. Kermit and Piggy tagging Scooter, their own teammate, on laser tag because he couldn't keep his own mouth shut. 4 out of 4 stars. I wish the other episodes are like this. LipsGF4Life, LouisTheOtter and Muppy like this. This was definitely one of the best of the season. Robin was adorable and his voice was actually pretty easy to get use to by the end. Piggy was also great in this episode since it showed how much she cared about Kermit and Robin that she would pretend to still be together with him just for Robin's sake. Fozzie and Rowlf finally spoke and was in the episode longer then a few seconds too! I also enjoyed Pepe and Rizzo's plot. I did enjoy Robin's more though. I just really wish we could've seen Gonzo and Camilla actually get back together and have more then a few seconds scene together. And have an actual conversation. LouisTheOtter and Muppy like this. Liked this episode. It was nice to see Robin again and I adjusted pretty quickly to his new voice. I can see why Kermit wanted to avoid disappointing him after his parents had broken up, but he took the news well in the end. Plus it showed Piggy being able to extend past herself and show concern for someone else. The little bits were also fun, seeing Rowlf again and then hearing about Pepe's bathroom pictures. My only quibble would be that we actually didn't see any of them, it would have made for a funnier end then the pillow fight scene. "My mom likes quiet nights and my dad likes my teacher." Also, Rowlf sang!! He sang three lines, yes, but he sang!!!! Grovette, LouisTheOtter and Muppy like this. Not much to add that hasn't already been said, so I'll say this: out of all of the episodes so far, this is the first one that I'm really excited to re-watch. Yes, I thoroughly enjoyed past episodes, but repeated viewings weren't a priority. "Little Green Lie," however, definitely going to pop out the DVR recording very soon! LouisTheOtter, LaRanaRene and Muppy like this. Best episode of the series yet. Nice balance of comedy, heart and great puppetry. This episode didn't revolve around Up Late with Miss Piggy, which is always something I enjoy. I'm looking forward to next week's 2 part-er! This was a nice episode. Not quite my favorite episode but still better than last week's episode (which I actually enjoyed despite popular opinion). If the show is ending I really hope Rowlf gets to do a lot more in one of the next two episodes. Also,I really expected Robin's voice to bother me but it really didn't at all. Also great that Lips had a line. I hope that when this show is over,some of the changes they made will still be a part of the franchise's future projects such as the introduction of Gloria Estefan and Yolanda's recently expanded role. Chip has also been a funny addition. 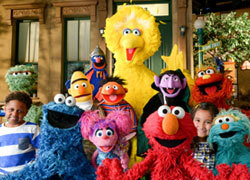 I loved it , it had more focus on the Muppets then the guest star. I was very pleased with the episode. A while back I mentioned Robin being a good character to bridge to on screen and behind the scene stories. I anxiously await my check. Hmm. But seriously. Wonderful to see Robin. The voice will take some time, but the puppetry was great and we will get used to the voice. I love that Kermit and Piggy can unite for such an important cause and I also love that most Muppets rush to exit because they cannot convincingly lie. (And even those who do go along blow it). Lara Spencer to me is a delightful lady who just sort of shows up places, and thus she did here. I know there is some (synergy) of her flirting with Pepe but they kept it to a minimum. Someone above mentioned they intelligence or the lack thereof of the Electric Mayhem. It is a bit tough to gage since Teeth himself seems himself in any video project. Lips is a bit of a cypher. Animal is an animal. Zoot so quiet during the Muppet Show days is quite an accidental poet with many of his lines. Floyd is a bit problematic. He was a hip hipster in the day and now he's very much a paranoid figure. I'll admit it is humor and an angle new fans can grab onto. So if Floyd's character is compromised I'll accept it. Janice, for me, is another issue. Some have complained that her character has been dumbed down. I disagree. It is different from what Richard did on the Muppet Show, but I work in the arts. I work with some folks who are star children or hippie men or women, and she rings about true. Like I said a bit trippy but she still know's which way the wind blows. She saw Sam's kindness to Chip. I do not think she has been dumbed down at all. (I do think the Floyd/Janice relationship, however, needs immediate attention). Closing thoughts: If there was justice Uncle Deadly (Matt Vogel) would be nominated for supporting actor comedy. Big Mean Carl should eat one character an episode. (Two on holiday episodes). Beautiful Day Monster was again in the background of a scene that probably did not need any background actors. I love it. LipsGF4Life, Branky and LouisTheOtter like this. It was great to see Robin make a visit, and I liked how his woobie status in TMS was played a little more subtly in this show; everyone notices him, for one. Matt Vogel still sounds a bit off voicing him, but Jerry's voice was just far too distinctive to perfectly replicate, and it's more important for him to get the personality right. I guess if you interpret Robin as being a little older in this show like I do, it shouldn't be too bad. I'm also loving the chemistry between Gonzo, Rizzo, and Pepe now that they're roomies. Also great to know that Foo-Foo wasn't digested by Big Mean Carl. Grovette and LouisTheOtter like this. Something to add - I'm really glad to see that Piggy is being treated as a three-dimensional character, and not simply "the diva." EDIT: Just remembered that Bill Barretta directed this episode. Kudos, Bill! It's great to see Robin again! Matt's doing a great job and Uncle Deadly is brilliant as always. I fully expected Rowlf to sing "I Hope That Something Better Comes Along" at the final bar scene. Bill doing Pepe drunk, that was funny as well as Fozzie's "acting" of famous movie lines. I expected Piggy to be happy after Kermit revealed that he and Denise broke up, but the actual result was better than expected. I really enjoyed tonight's episode of The Muppets! Bill Barretta did a great job directing this one. This may be my favorite episode of the Season! My favorite things about this episode are the following. 1. It was really great to see Robin again. Matt Vogel really does a great job with him, he made Robin just as sweet as Jerry did. 2. It's nice to see that Gonzo and Camilla are back together. 3. As always, Uncle Deadly steals scenes! 4. Seeing Pepe drunk is always Hilarious! 5. Rowlf singing "As Time Goes By"
6. I love the fact that Gonzo, Rizzo and Pepe live in the same house now! to me they are the Muppet Rat Pack! 7. I love that Miss Piggy has become much nicer now. That trip to Argentina really helped! 8. I also loved seeing the Swedish Chef's food performance. 9. The Friendly feud sketch was great too! Everybody needs to stream this episode and all the previous ones too! I really wanna see a 2nd Season! Branky, LouisTheOtter and Muppy like this. This might be the best episode so far. I feel there was a missed opportunity with the Friendly Feud sketch. 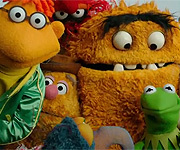 I feel that the group competing against the Electric Mayhem should have been another band or singing group. It is weird that Robin enjoys time with Kermit and Piggy, since he and Piggy have rarely interacted before. But we do see several images of times they've spent together. And Robin is happy with calling her Aunt (Miss) Piggy... I know Piggy told him to call her Aunt Piggy in the Linda Lavin episode. I feel sorry for Rizzo and Pepe, their wingmen end up with the women their after (and did that Good Morning America star practically say that Pepe could have had her all along? ), and then Camilla's friends end up being two hot human women who were actually interested in the two.